Social exclusion is a key problem for policy makers, researchers and professionals worldwide. Despite this, the debate lacks a dominant disciplinary focus. 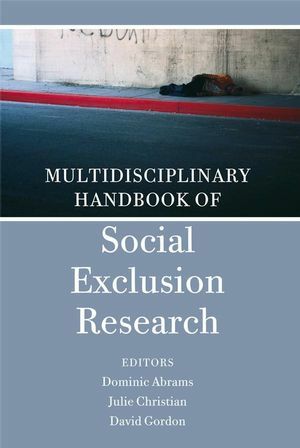 This innovative handbook covers evidence from key research and policy to offer cross-disciplinary perspectives on major areas of social exclusion. Focusing on central policy domains including education, healthcare and crime, it is structured so as to relate evidence to the state of social exclusion and the mechanisms by which it can be tackled. It book will be an unrivalled reference for academics and practitioners working across disciplines including housing, education, psychology, political science, healthcare, sociology and law. Dr. Julie Christian is a lecturer in Social Psychology at the University of Birmingham. Her research focuses on the application of attitude and inter-group processes to various areas within social service provision, with particular regard to homelessness. She has published numerous journal articles. Professor Dominic Abrams is the director of the Centre for the Study of Group Processes at the University of Kent. He has published extensively in journals and is the editor of the European Bulletin of Social Psychology. He has authored/edited 6 previous books. Chapter 1. Social Exclusion and Social Policy Research: Defining Exclusion (Jane Millar). Chapter 2. Women's Social Exclusion (Diane Houston). Chapter 3. The Social Psychology of Exclusion (Paul Hutchison,Julie Christian and Dominic Abrams). Chapter 4. Stigma and Exclusion in Healthcare Settings (Elizabeth Mason- Whitehead and Tom Mason). Chapter 5. Homelessness and Social Exclusion (David Clapham). Chapter 6. Education and Social Exclusion (Peter Hick, John Visser and Natasha MacNab). Chapter 7. Care Leavers, Exclusion and Access to Higher Education (Sonia Jackson). Chapter 8. Social Exclusion and Crime (Chris Hale and Marian Fitzgerald). Chapter 9. Social Inclusion: Race and Ethnicity: Policies in New Clothes (Greville Percival). Chapter 10. Business and Social Inclusion (Ken Peattie). Chapter 11. History and Development of Social Exclusion and Policy (David Gordon). Chapter 12. A Relational Analysis of Social Exclusion (Dominic Abrams and Julie Christian).